How to Choose the Best Garden Shed for Your Garden? homezweethome.info -If you intend to build a shed in your garden, it is important that you decide on the right item. Choosing the right shed might not be as easy as it appears; you have the knowledge to identify the correct structure that fits perfectly in the area you are planning to install it as well as in your budget that you have arranged to spend on it. Here are a few points that will help you choose the perfect structure for your garden or backyard. Yes,it does, especially when it comes to choosing the perfect shed to put up in your garden. Before you move on with your search of finding the shed, ensure that you have measured the area properly. Buy a structure that fits perfectly in the area. A small shed in a large area and an over-sized one in a relatively smaller area may not look as good as it should. Hence, choose the one that is properly sized for your garden. With the upsurge in the popularity of these structures, manufacturers are trying out different measure to make these even more durable and easily installable. Apart from timber sheds, structures made of metal,plastic and vinyl are also in vogue in recent times. The sheds made from metal, vinyl and plastic are more durable and lighter,compared to the timber sheds. They are also easy to install as well. But the ultimate choice lies in your hand; you can only decide which type of structure will be most useful for you. The choice of the material is based on the type of climate you have in your area; that is, if your area receives plenty of rainfall, then it is better to opt for plastic or vinyl sheds instead or wooden sheds that might erode or get eaten away by rust due to excessive rain. Moreover, go for a timber shed if you live in an area with plenty of sunshine as vinyl or plastic gets excessively hot and uncomfortable under the scorching sun. A beautiful garden shed not only puts an end to your storage problem, but also adds to the beauty of your home. These structures are available in various styles,you just need to take your pick. While choosing a particular style it is important to identify the actual purpose for setting up the structure, whether you want to use it as a simple storehouse or utilize for numerous other purposes. If you are just planning to have it as a storage shed,then any simple structure with no stylish decorations will do. But if you are planning to put it to other uses as well then you must keep in mind to choose a structure with a particular pattern to match the objective of its utilization. You can search for various types of garden shed over the internet. 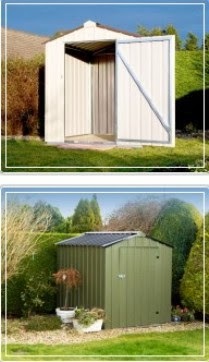 The garden sheds Ireland are one of the best you can get. Shop around till you get the best structure in a price that fits in your budget as well. Author’s Bio- Niall Mulvey, works for a reputed manufacturer and dealer of garden sheds Ireland and a lot of knowledge about the installation of these structures that he shares in his articles.